A dramatic attempt to steal the the golden ninja warrior. Women fighting each other in scenes of breathtaking violence. A gang of bloodthirsty thieves tries to outdo the forces of justice. Ninja supremacy in the fight against evil and tyranny. 00m 00ws – Intro/Golden Ninja Warrior review. 52m 42s – Mike Abbott biography/Death Code Ninja source movie background. 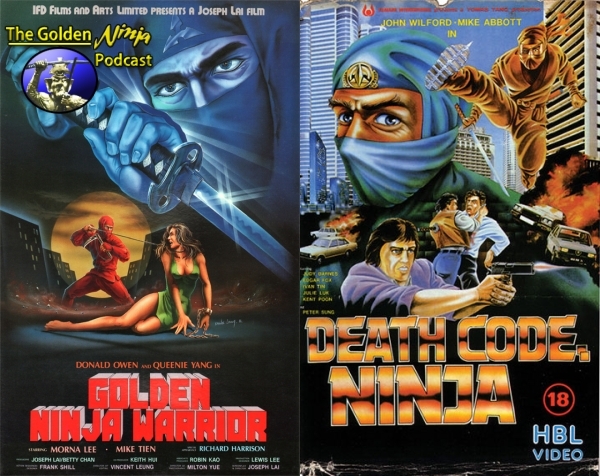 66m 42s – Death Code Ninja review. Ken’s note: I mention Mike Abbott is in A Better Tomorrow. This is incorrect as he’s in A Better Tomorrow II. Contact the show via email at podcastonfire at googlemail.com, on our Facebook page and Facebook group or Twitter (@podcastonfire, @sogoodreviews) and SUBSCRIBE to our iTunes feed . Intro music created by JAKAZiD.